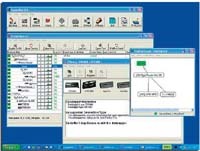 LoggerNet 3.1, our full-featured datalogger support software, facilitates programming, communications, and data retrieval between Campbell Scientific dataloggers and a PC. This 32-bit software supports all contemporary dataloggers (including the CR1000), all datalogger operating systems (e.g., mixed-array, table data, PAKBUS®), and many retired dataloggers (e.g., CR500, CR10, 21X). [Main Features] Connection to a datalogger or network of dataloggers, either by serial cable, RF link, cell phone modem, ethernet. On demand or scheduled data downloading. Local / Remote (serial cable,R.F link,cell modem, ethernet). Setting ports/flags. Local / Remote(serial cable,R.F link,cell modem,ethernet). i.e. open flood gates, turn fans off/on. PC400 is Campbell Scientific's mid-level datalogger support software. This versatile software supports a variety of telecommunication options, manual data collection, and data display. It includes an easy-to-use program generator as well as full-featured program editors. Support for our CR200-series, CR510, CR10(X), CR1000, 21X, CR23X, CR7, CR5000, and CR9000(X) dataloggers with mixed-array, table-data, or PakBus® datalogger operating systems. [Main Features] Connection to a datalogger or network of dataloggers, either by serial cable, RF link, cell phone modem,ethernet. Datalogger programming, depending on the data logger using either Edlog or CRBasic. Local/Remote program uploading (serial cable,R.F link,cell modem, ethernet). On demand data downloading. Local / Remote (serial cable,R.F link,cell modem, ethernet). 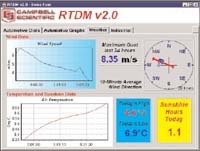 RTDM Real-time data monitor software. Real-Time Data Monitor 2.0 (RTDM) is a powerful program that allows you to design display screens. The screens can display real-time data retrieved from LoggerNet servers and/or near real-time data retrieved from data files. The RTDM designer environment gives you control over your data display with color, images, and graphical components. Provides interactive graphs, dials, and digital values that can be easily customized. Refreshes the display automatically as new data becomes available. Includes interactive controls that allow the input locations, public variables, ports, and flags to be changed via a LoggerNet server. Triggers alarms based on user-set values. Sets values in one datalogger based on values from another datalogger. Exports GIF, JPG, and PNG images for use on a Web site. WeatherQuery is a compact graphical display designer for logged data. User designed display layout using graphical components. Chart, Rich Label and Wind Rose. Scheduled / conditional email reports. Served page / component captures. * current file type plugins include, Campbell Scientific array*, table* based file types, Inteltronics Data Collection Platform file types. Copyright © 2005 Inteltronics Instrumentation.